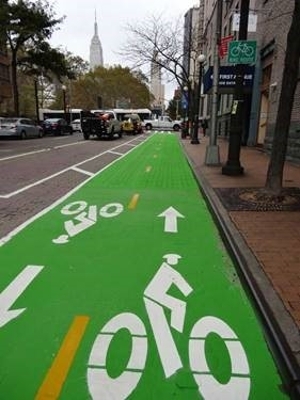 On Saturday, March 23, two downtown blocks in the City of Alton will be transformed to demonstrate how two-way bicycle traffic would function. Southern Illinois University Edwardville’s Successful Communities Collaborative (SSCC) is hosting the “pop-up” event on East Broadway in collaboration with Alton’s proposed Pedestrian and Bicycle Plan, according to Connie Frey Spurlock, PhD, SSCC faculty director and associate professor in the Department of Sociology. SIUE students will temporarily transform the streets by installing design features such as temporary paint, tape, cones and more. “The pop-up event provides shoppers, business owners and other community members a chance to experience and influence proposed street-level modifications, before deciding to support or oppose those modifications,” said Frey Spurlock. Participants will experience the change and be invited to share feedback at the SIUE/STL Art Hive that will be set up in the area. The art hive will be hosted by SIUE’s art therapy counseling program. Photo: SIUE Successful Communities Collaborative is partnering with the City of Alton to illustrate “pop-up” features to demonstrate how a two-way cycle track would function in downtown Alton.